We all know that feeling when you've slept badly for a couple of nights in a row and you feel as though no amount of concealer will cover those damn eye bags. Well, if you smoke, research has found that you will experience this feeling more than non-smokers! Smokers are 4 times more likely to not feel as though they have had a good nights sleep according to studies. This could well be down to feelings of nicotine withdrawal, the stress of withdrawal leading to a bad night's sleep which in turn leaves you with dark circles underneath your eyes. Smoking can also damage eye vessels leaving them looking irritated and bloodshot. No-one wants to look permanently tired! Although wrinkles are an inevitable consequence of the natural ageing process, smoking can quicken up the signs of ageing appearing on your face. On average, experts say that smokers aged 40 have as many wrinkles as a non-smoker aged 60! The effect of smoking on the ageing process may not be visible in your 20s or 30s but is still happening as you inhale that smoke. It is also said that smoking affects the blood supply to your skin, making it less supple, whilst scientists have found that cigarette smoking also releases an enzyme which breaks down collagen in skin. This will leave skin looking saggy, wrinkly and older than your age. One of the most commonly known beauty-related side effect of smoking is the yellow staining around teeth, gums, fingers and nails. The highly addictive nicotine found within cigarettes stains wherever the cigarette is touching. turning them a very noticeable yellow colour that no amount of brushing your teeth can fix! Smoking also increases your risk of developing oral cancers and gum disease, which could possibly lead to you losing your teeth altogether. There are also studies which have found that smoking is responsible for a whopping 40% of all chronic cases of periodontitis- a condition which leaves the sufferer with swollen gums, bad breath and potentially tooth-loss. When we think of beauty, we conjure images of natural, glowing skin; this appearance is, after all, continuously linked with youthfulness. As mentioned, smoking affects the visibility of the ageing process on skin, but few people actually know that it can have a huge impact on the immediate appearance of your skin too. 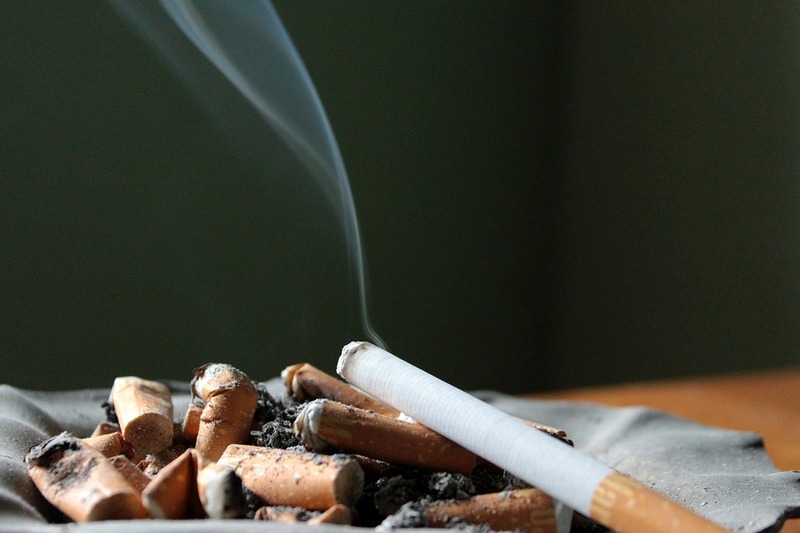 Not only are you faced with the drying effects of tobacco smoke, but smoking cigarettes drains vital nutrients like vitamin C (a wonderful antioxident which helps to boost collagen production), whilst the nicotine within cigarettes can reduce blood flow to the skin tissue through the narrowing of blood vessels, meaning insufficient oxygen is supplied to the skin. Dull-looking skin in turn makes you look more tired and older, thus counteracting all the hard work of your beauty lotions and potions! Psoriasis is an autoimmune skin condition that. although isn't life-threatening in any way, is an incredibly uncomfortable condition from which to suffer. Research has found a strong correlation between smoking and psoriasis. Puffing away on those cigarettes will significantly increase your risk of developing the condition- smokers are up to 3 times more likely to develop psoriasis, with women facing an even higher risk! What's more important to consider is the risk that second-hand smoke might have on those around you; there is also a link between passive smoke inhalation during pregnancy and childhood and an increased risk of developing psoriasis. The highly toxic chemicals sitting in that cloud of smoke you blow out can affect the DNA in hair follicles and generate free radicals (particles which damage cells, you might have heard of them as a beauty buzz word this year). Recent research has also found a strong link between smoking and hair turning grey faster too; if you're proud of your luscious locks, this long-term effect of smoking those cigarettes might make you think twice. Although some of these side-effects are caused by nicotine and thus wouldn't be immediately resolved through e-cigarettes or nicotine patches, it is definitely a great place to start as a stepping stone to quitting. Shops like Simply e-Liquid provide everything you would need to get you on track in one place and give you so many options to choose from. Using quitting methods such as e-cigarettes will stop your body being subject to the nasty side-effects listed above that involve the smoke, tobacco and toxins that will heavily impact your appearance. It's at least some food for thought if you are considering giving up smoking as we enter the New Year and start preparing those resolutions! Have you quit smoking, are currently quitting or thinking about doing so? If you have any helpful tips then please do share them below! This is a sponsored post in collaboration with Simply e-Liquid however all opinions are my own.